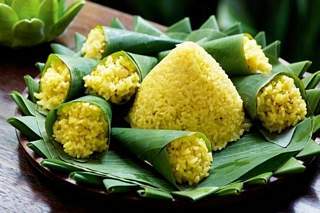 Rice colored with turmeric and shaped into a cone is a common sight during festive occasions in Bali and Java. The conical shape echoes that of the mythical Hindu mountain, Meru, while yellow is the color of royalty and one of the four sacred colors for Hindus. Even in Muslim Java, this traditional festive dish remains popular, and is accompanied by sambal trasi, classic grilled chicken, and eggs in fragrant lemongrass sauce. Combine the rice, turmeric juice, coconut milk, chicken stock, salam or pandanus leaf, lemongrass, galangal, and salt in pot and bring to a boil over high heat. Reduce the heat to medium and simmer cooked until the liquid is absorbed, 10 to 15 minutes, then reduce the heat to low and cook for 5 to 10 more minutes, until the rice is dry and fluffy. Remove from the heat and mix well. Alternatively, cook the rice and ingredients in a rice cooker. Discard the salam or pandanus leaf, lemongrass, and galangal. Press the cooked turmeric rice into a cone shaped, if desired. Serve the cooked rice with the accompaniments on the side.